Techlink 680080 1.5m Scart Cable, Flat Cable Scart Lead with OFC Cable and Gold Plated Contacts. High-end performance at an unbelievable price. Double shielded non-migratory Oxygen Free Copper conductors throughout. Individual Al-Mylar Aluminium foil shielded signal cables for improved picture and sound-to-cable signal migration. Flexible PVC outer jacket to bend and fit into the tightest of spaces. Laser etched chrome plated metal scart connectors. The Techlink Wires CR 680080 is a high resolution, fully wired, RGB compatible, universal Home Cinema connecting lead for the transmission of the audio and video signal between devices such as a TV and VCRs, DVDs, Digi boxes and game consoles. SCART cables carry both composite and RGB, video, stereo audio input/output and now supports S-Video signals. Features VCR play mode detection and auto switching. Scart is the most common method of connecting audio-visual equipment together in the UK and Europe. 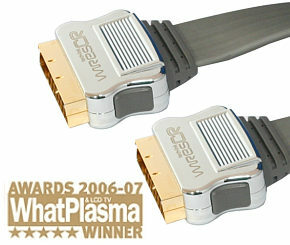 TOSLink Optical Splitter, 2 way split. Allows connection of one optical source to two receivers. Finished in a stylish silver/grey. 3m White 3.5mm Jack Cable Straight to Angled Straight to 90 degree right angle 3.5mm connector both ends Stereo audio jack plug to stereo jack plug. Gold plated connectors. Colour white Length 3 metres Ideal for connecting audio devices to aux in connections Suitable for use with phones, tablets, laptops, PCs, ipods, portable audio devices and any other device with a 3.5mm audio output. 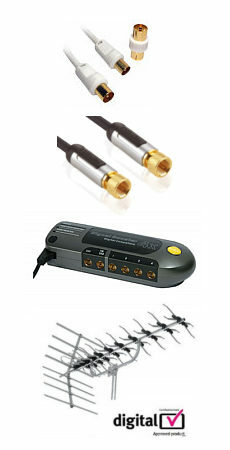 High quality Phono to Phono leads. Metal body connectors with Gold Plated contacts. Oxygen Free Copper cable. Ideal for subwoofer connections.